Common across all of eastern Australia, these noisy birds can form huge flocks, resting in regular roosts close to water during the heat of the day and generally heading out to open country to feed either earlier in the morning or later on, when it is a little cooler. 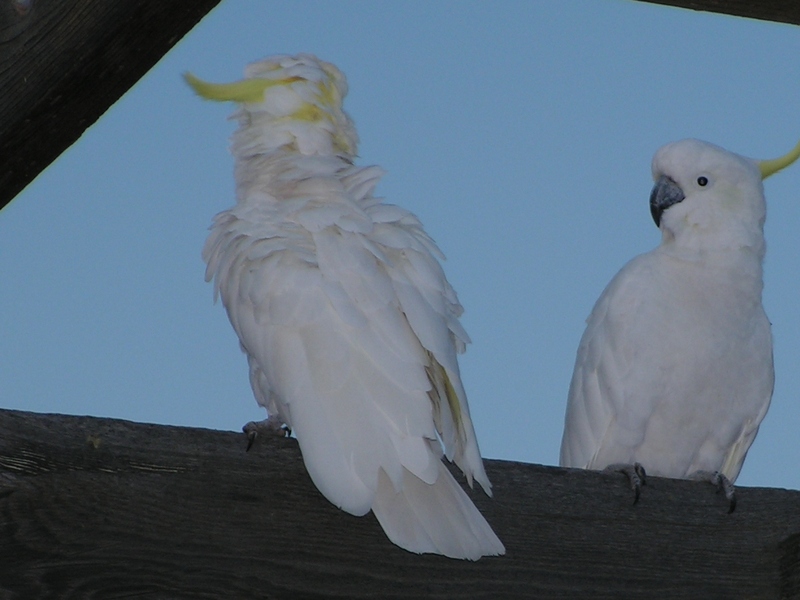 Luckily, the pair of Sulphur Crested Cockatoos that stopped by my garden recently didn’t presage the arrival of a huge flock, but they did provide a few moments of pleasing entertainment. Contrary to the way it may seem, I have a bit of a soft spot for these raucous natives. They are the clever clowns of the garden and are not immune from playing practical jokes. We had a large old pine tree in the garden of our house in suburbia where a small family of cockatoos used to congregate to break open the pine cones and eat the nuts. Not so sure about the pine cones they used to drop on unwary gardeners and small children. No. I’m not kidding. They used to wait until someone was passing underneath and then, basically, throw a pine cone at them. And laugh. True. Or they would fly a low pass overhead and screech at the top of their voices from just behind their chosen victim. Believe me, they are loud. Does wonders for getting the heart pumping. Whilst I had no objection to them eating the pine nuts, I was a little less pleased when they got stuck into our almonds. There was no keeping them out either. They generally found a way into or under any netting we put over our young trees, and looked at us with scorn if we tried to chase them off. They just laughed at the dog, who would stand at the base of the tree, barking, knowing full well that there was nothing that she could do! Of all the birds, I think that the cockatoo has the most developed sense of humour. 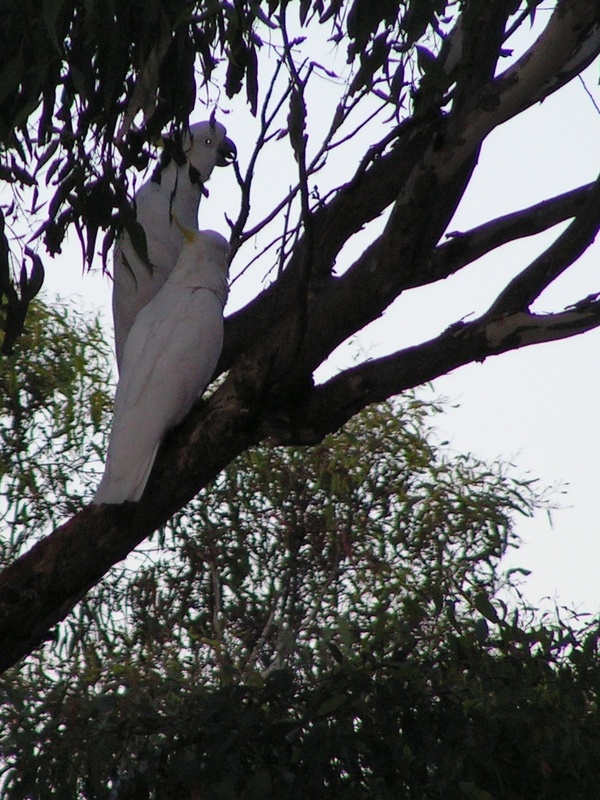 When we moved up from Melbourne some years ago, our new neighbours had a pet cockatoo that lived on a perch on their front verandah. Our cat was a keen birder, despite our best efforts, multiple bells and water spray therapy. She took one look at Cocky and you could see her eyes light up. Heaven. On a stick. I was chatting with our neighbour, Anne, at the time and spotted her (the cat, not the neighbour) stalking across the garden. With huge apologies, I went to prevent what I thought would be a disastrous introduction only to be stopped in my tracks. “No, watch this,” Anne said, grinning. A little reluctantly, I watched. My feline friend continued her soundless approach, while the ‘unsuspecting’ cockatoo completely failed to notice. I nervously explained that our cat was a very efficient hunter. Cocky was by now preening his feathers peacefully while the Great Hunter bunched up her muscles, poised for the pounce. I swear she was already in flight when Cocky suddenly exploded in size, fluffing up his feathers, extending his wings and opening out his beautiful yellow crest, giving an ear piercing, blood-curdling screech. The Great Hunter turned in mid-air (against all the laws of physics) and disappeared under our deck, from whence she refused to return until Cocky went to bed. Cocky bounced up and down on his perch, while Anne explained that this was his normal way of greeting any visiting cats. I would like to say that our cat was cured of her hunting tendencies as a result of that event, and, indeed, it did cramp her style for quite a while (nor did she ever approach Cocky again), but we still had to perform the occasional rescue over the last few years of her life. Meanwhile, Cocky’s favourite idea of a joke was to call out to passer’s by, usually inviting them to go to the pub with him, in a voice so realistic that people unfamiliar with him would be looking around for their erstwhile new friend. 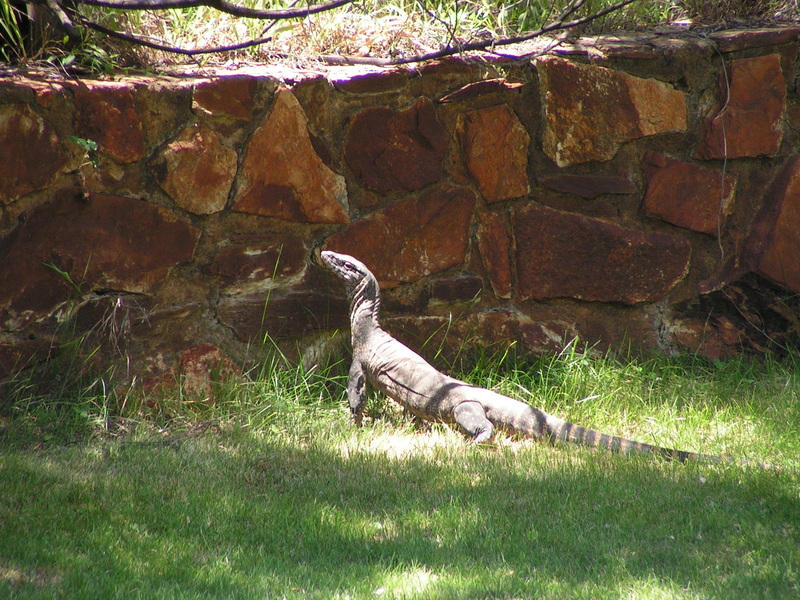 The visitors to our garden the other day were, by comparison, quite benign. Although they did spend some time investigating our weather station. 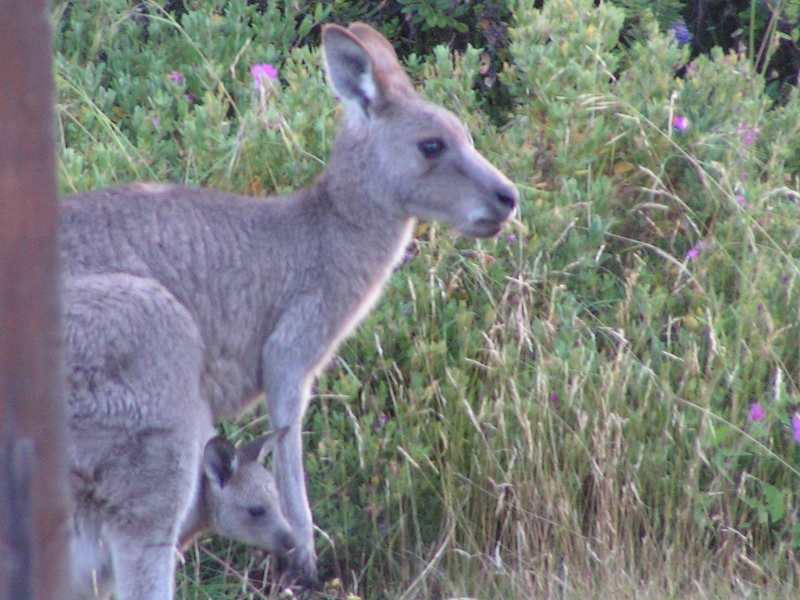 And I’m not saying that they wouldn’t have attacked our fruit trees if the wallaby had left them anything to attack. Still, I’m happy for them to be occasional guests, stopping by once in a while… just, please, not in clouds, descending like snow. Take one cockatoo and pop it in a billy of boiling water with a rock and a handful of root vegetables. Boil until rock is tender then throw away the cockatoo! I gather they are a bit on the tough side. Never felt the urge to find out, personally, but there you go. Post Post Script: the collective noun for these comedic birds is recorded, variously, as a chattering, clattering, cluttering, crackle, or cacophony of cockatoos. My vote is for the cacophony. Post Post Post Script: if you are keen to encourage these delightful birds into your garden by feeding them, I’m given to understand that they are partial to all kinds of seeds, nuts and fruit. They are also partial to eating any wood that your house or garden structures may be made from, bird netting or shade cloth, and the occasional TV aerial. 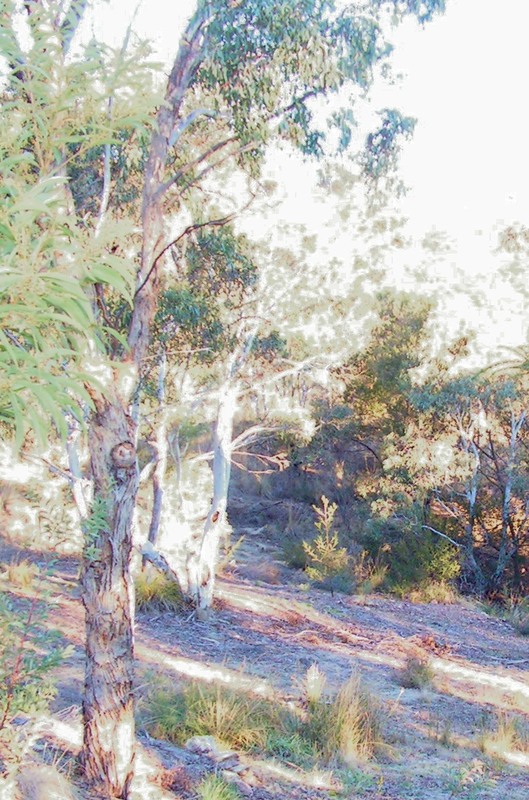 This entry was posted in our story, outdoors, rural / bush living, Uncategorized and tagged almonds, Banjo Paterson, birds, cats, jokes, pine nuts, recipes, Sulphur Crested Cockatoo, wildlife on April 23, 2014 by seventysevenacres. 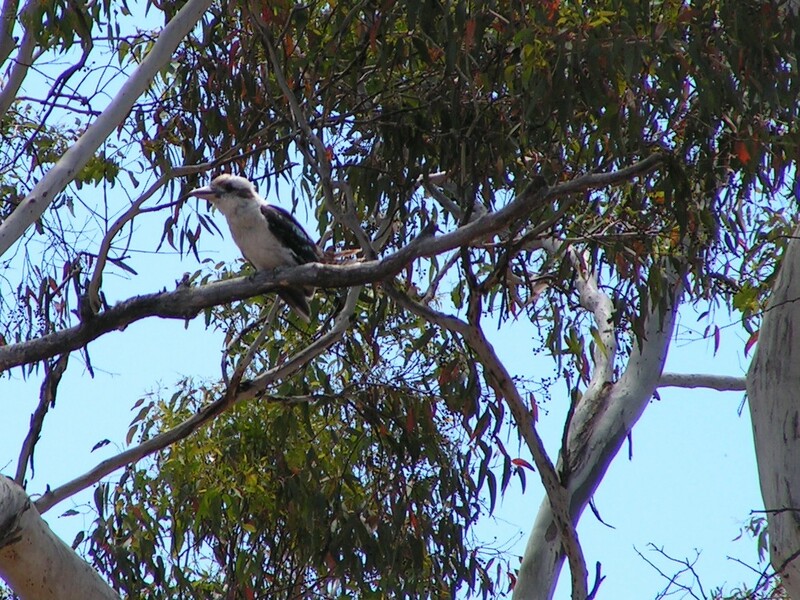 A pair of kookaburras has recently taken to visiting our garden and the immediate surrounds. While they are certainly not the only ones around – there are several ‘tribes’ that we hear calling regularly, from different parts of the property – this particular pair are definitely feeling quite at home in our presence. The one in the photo is watching while Matt is clearing the slope down to the lower dam (getting rid of the long poa grass and spiky acacia bushes) in preparation for summer, and is not at all worried by the noise of the brush-cutter or the mulcher. 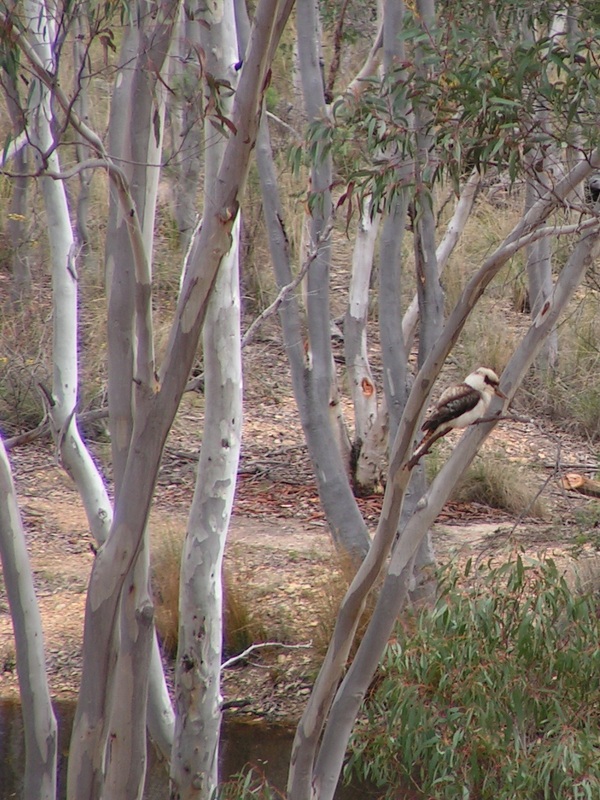 Kookaburras are a kind of kingfisher and are quite large in size, up to about 40cms in length. They are carnivorous birds, mostly living on insects, worms and small crustaceans. They certainly like the yabbies in our dams. We often find their leftovers – a bit of claw – here and there around the place. I’m told that kookaburras are also partial to frogs, small mammals and birds, and young snakes. I found a small – somewhat dead – brown snake, minus its head, outside our bedroom window one day last year, and can only surmise that one of the kookaburras dropped it while flying over! I’m wondering if this one is on the lookout for a something to eat – he (or she – I’m not sure how to tell) may well be hoping to score a quick treat running (or slithering) away as Matt works his way down towards the water. Or perhaps he is just curious. Some of the things we people get up to must be quite incomprehensible to the wildlife we share our home with. I’m guessing this must be a young pair, just setting up home. They seem to be on their own, anyway, and not part of one of the other tribes. Apparently, kookaburras mate for life, and the young from previous years’ matings help with parenting duties until they make their own way out into the world, so perhaps these two are enjoying their first season together and will be building up a family over the next few years. I’ll certainly be keeping an eye out for them. They are a beautiful (and cheerful) addition to the list of visitors whose company we enjoy. This entry was posted in Uncategorized and tagged birds, bush, kookaburra, wildlife on October 5, 2013 by seventysevenacres. For Will and me, winter during the week is an indoors sort of time. We are generally up before the sun and getting ready to drive into school, and arriving home as the last rays of light disappear over the mountains to the west. On the drive back out of town, we often see the last of the sunlight, watery and pale, washing two large peaks just beyond Seventy Seven Acres with a golden orange glow. Sometimes we arrive home in the grey twilight, sometimes in the pitch dark. Occasionally, very occasionally, we might get home before the light fades… but this is a rare treat. Once home, there is little to do outside other than fetch in some extra wood for the fire or take kitchen scraps out to the compost. Will might run around with a torch for a while, but it doesn’t take long before he heads indoors to the fireside to catch up with what Matt has been up to during the day. 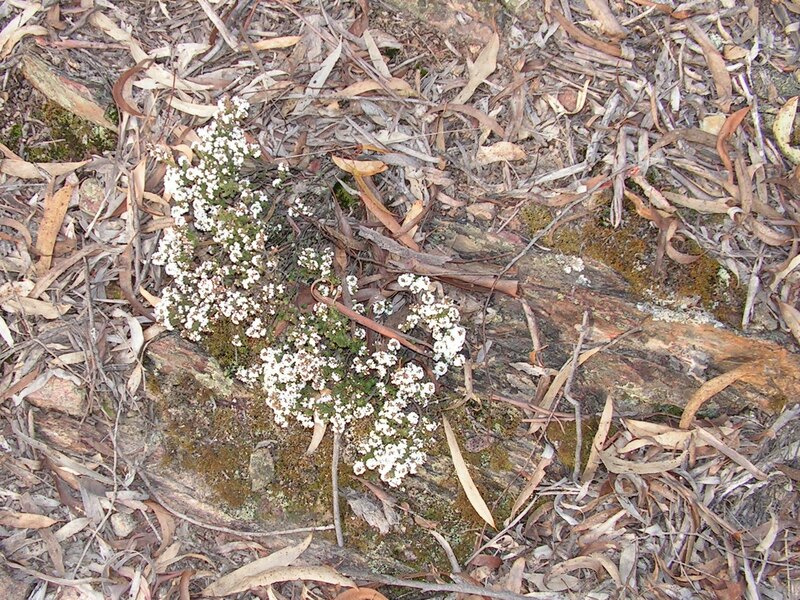 A small winter flowering shrub… possibly a heath of some sort. We join Matt on his never ending quest to find good wood to burn, or wander round the bush enjoying the winter wildflowers or looking for signs of the animals that share our little piece of heaven. Today we have blue skies after a windswept night, with heavy rain-filled clouds to the south of us, blowing away towards the coast. Matt and Will have gone abseiling, and I’m just stealing a few moments to catch up on a bit of writing before I grab my coat and go for walk. Outside my study window I can see some beautiful scarlet robins, two young males resplendent in their bright colours, chasing each other around. It all looks rather playful, but I’m guessing that there is quite a lot at stake for these two in the mating game. A small flock of finches is flitting in and out, too, and my friendly burrawang is picking his way through some scraps I put out earlier. Beatrice with her new little one… still to be named. 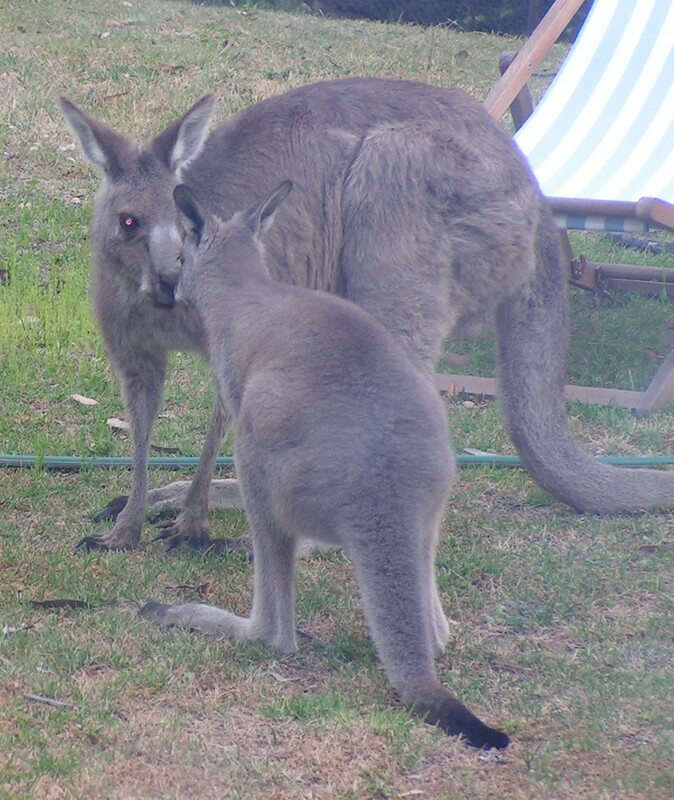 There’s no sign of Beatrice and Eugenie today, but I did get my first peek at Bea’s new youngster through the kitchen window earlier in the week when she popped her nose out of the pouch for a few minutes before deciding the wind was too cold. I also had a pair of juvenile visitors – I’m suspecting it might have been Cerise with a younger sister, but no sign of Annie, so I couldn’t be sure. 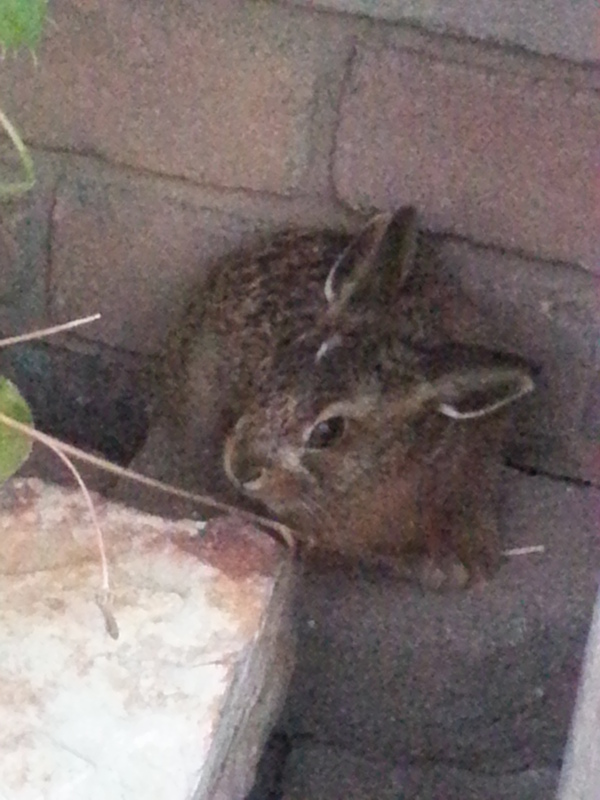 They were a bit nervous, though, and they hopped away when I went out to try and get a closer look. Anyway, time to pick up my coat and go and enjoy some sun on my face and the breeze in my hair… who knows what I might see today? 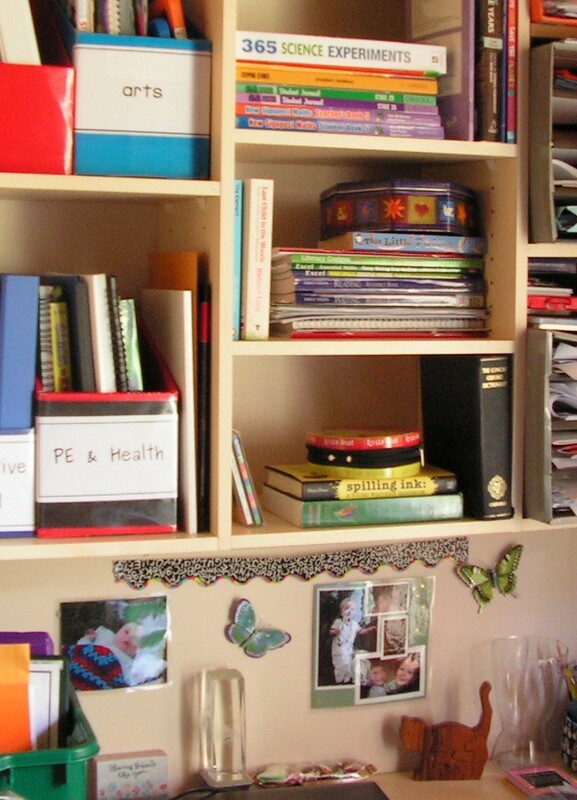 This entry was posted in Uncategorized on August 17, 2013 by seventysevenacres. …comes in many forms. Sleep-warmed, fluffy bedclothes in the early hours of the morning. Cuddly woollen jumpers and quilted coats. A roaring log fire. And, just occasionally, balmy afternoons bathed in crisp winter sunlight. Today was a sunny winter’s day, just perfect for a walk around the bush and collecting kindling for the roaring log fire. 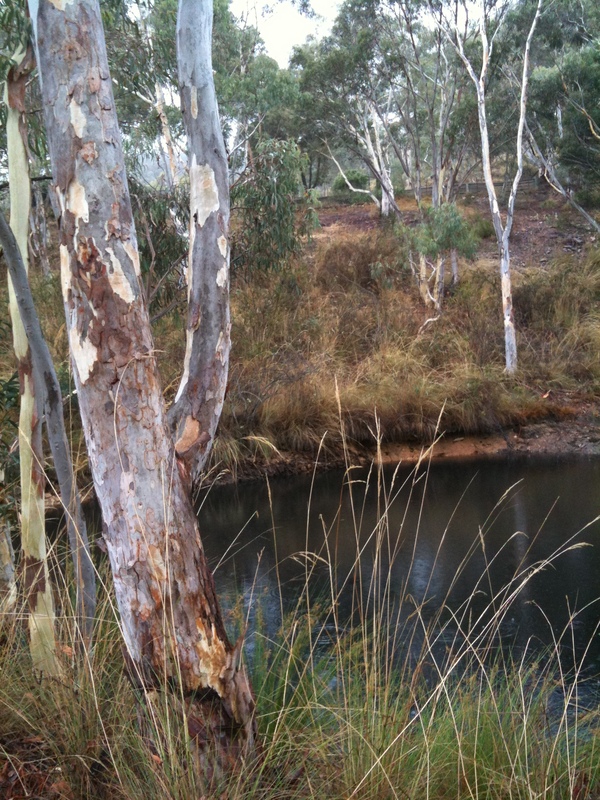 We were down below the lower dam, tidying up some dead trees and filling the landrover’s tray with all the small branches and twigs that had been left behind after Matt took out a couple of long departed black wattles and a brittle gum a couple of weeks ago. We were taking it pretty easy… enjoying the sunshine through the trees and allowing ourselves to be distracted by signs of wildlife in the area or birds of various varieties flitting through the branches. “What’s that one?” I’d ask, and we’d start discussing the possibilities. I’m not sure we reached any certain consensus, but there was this little brown one, then there was a slightly larger brown one with a fan tail. Next time I’m taking my field guide in my pocket. Anyway, birds aside, we filled the tray pretty quickly and went for a wander further down the hill to see what else might need to be tidied up next time we had a nice day. I think we were still being easily distracted. We did find some more wood to collect, but we found a few other things, too. We found some wombat scats, carefully placed on top of an old fallen tree, and I wondered if they belonged to the dark haired young wombat that had been meandering up the track the other day when I arrived home so late, but we decided that, no, these were too big for a young wombat and they probably belonged to the old, cranky fellow that is slowly spiralling in on us. We found a hollow tree with a perfect hole for a parrot or an owl. (We have several types of owl that come visiting, catching moths attracted by the house lights – no success with taking pictures yet, though). We found a lovely open clearing with a beautiful view down into the Valley. The shadows were starting to lengthen out by now, but this little clearing was a haven of golden sunshine. Needless to say, not only had I left my library on the shelves in the house, but I had come out without my camera (or my phone – it takes pretty good pictures, if only I’d had that in my pocket). The picture above is from the back garden after we got back to the house. …must be just about time for a nice warming cuppa. Winter warmth comes in many forms. This entry was posted in Uncategorized on June 30, 2013 by seventysevenacres. If you are Australian, or at least a resident of this beautiful country, you have doubtless noticed that there are a lot of songs and poems all along the same theme of ‘dusty’, ‘red soil’, ‘droughts’ and ‘flooding rains’. You will have heard a lot of them over the last few days, as Australians everywhere took time off work to celebrate what is, despite these aspects remembered in verse, a truly beautiful country. Even if you aren’t Australian, then you might have noticed and wondered just exactly what this whole preoccupation is about. …but, we have friends in Victoria who are on high alert as hot conditions and strong winds are fanning fires that started not far from where they live during the course of last week, while other friends are weathering the storms in Queensland and Northern New South Wales, with torrential rain – yes, flooding rains – and damaging winds. For our friends, so far, so good, but it does seem like Australia is truly living up to her reputation right now. No time off for them to celebrate. This is a land of extremes, and recent years have been a real testament to how powerful a force nature is in the psyche and lives of those who are born or choose to live here. We are courting a tempestuous and demanding lover. I can’t get over how quickly our garden seems to have ‘greened up’ again. Only a week and a half ago, I was quietly lamenting that I had no flowers to brighten the house when my friends came to visit. Now, all our roses are putting on a fine show. It won’t be long until nearby Canberra will be putting on her Autumn mantle and the suburbs will be clothed in hues of red and gold (if you chance to visit, go up to Red Hill or Mt Ainslie and look across towards the city from one of the lookouts) and the days will be less harsh. One or two of our garden trees will gradually change before shedding their leaves, but our bush will mostly be clothed in soft mists, curling around the greys and greens of the eucalypts and damping the darkness of the black wattles. Before that, the weatherman tells us, things will warm up again and we can’t afford to lower our defences yet. We still have to be vigilant. 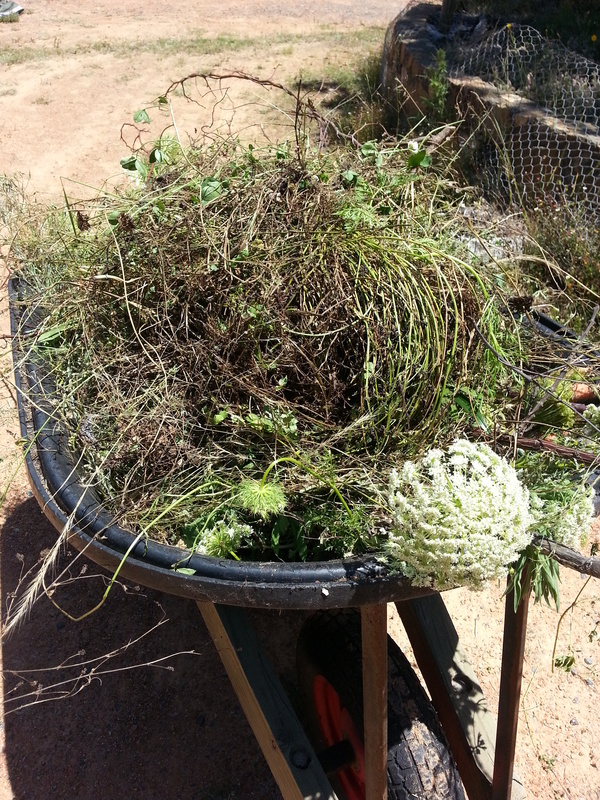 We still have a lot of work to do, tidying up the bush directly around the garden. As for our friends, north and south, they have a lot more work to do right now, and there are a lot of Australians starting the year suffering the shock of losing loved ones, homes and livelihoods in the wake of fires and storms. 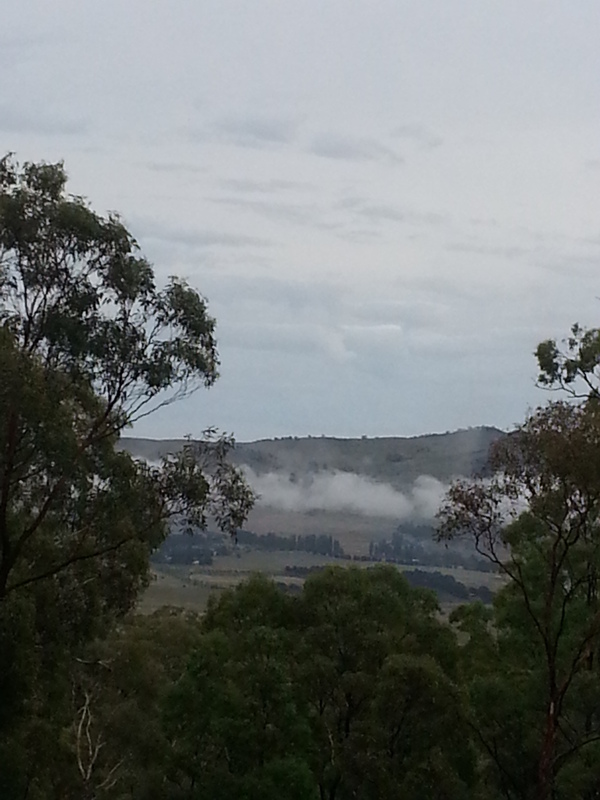 I do love a sunburnt country… but not so much the droughts and flooding rains. A little restraint might be nice. This entry was posted in Uncategorized on January 29, 2013 by seventysevenacres.